There are fantastic swim courses on the worldwide ironman circuit. Among my favorites are Kona, New Zealand and Florida. I've completed the Ironman swim in 29 races, and while I'm not a great swimmer, my swim times have sometimes varied from course to course more than expected. So I did an analysis of 100,000 Ironman finishers to try to answer the question: Is it possible that the degree of difficulty swimming 2.4 miles differs by location? The data says yes, if you assume that all swim courses are measured reasonably accurately. Here's how they compare on average. Then continue reading: there's much more to the story. Factors that impact average swim times can range from a very tight swimming venue, very rough open water, or speedy currents. And these factors can have dramatic impacts. 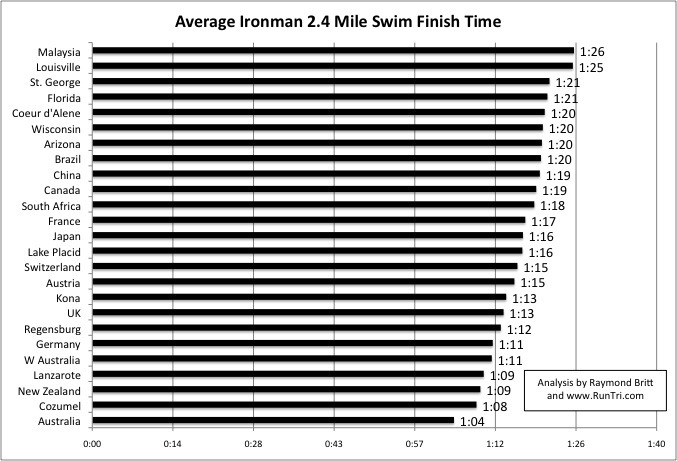 In the slightly dated chart above (newer one to be posted soon) comparing 25 Ironman swims, Cozumel is shown as one of the fastest at an average 1:08 split. 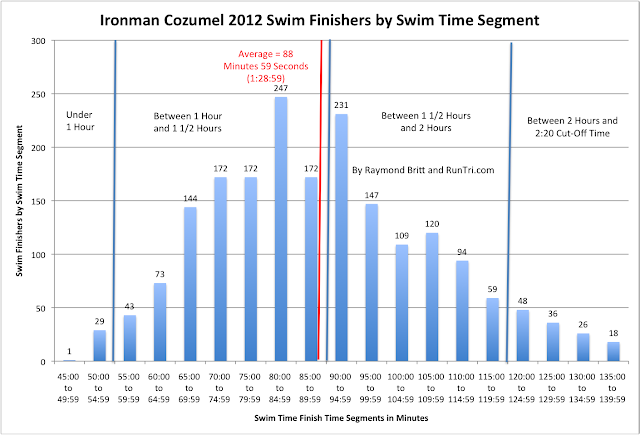 However, at Ironman Cozumel 2012, the average time was 1:28:59, see chart below. Reports from Cozumel swimmers indicated a particularly challenge last section of the swim, and some athletes described their times as 10-15 minutes slower than they expected. 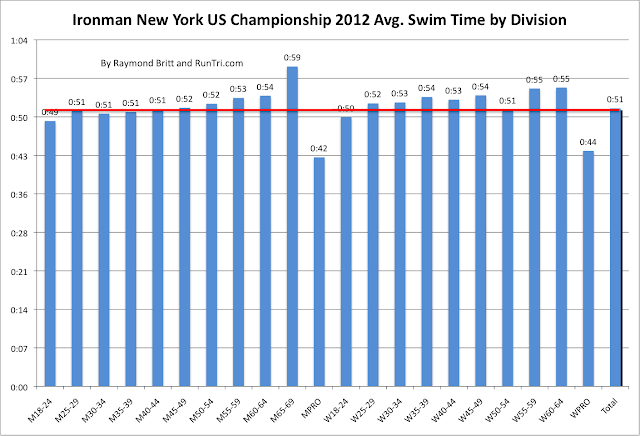 And swimmers at the Ironman US Championship 2012 in New York City cruised with the current to an average 51 minute swim split. For even more detail on all races, visit our Toughest/Easiest Ironman Race Analysis and our Complete Archive of Stats and Results Analysis.